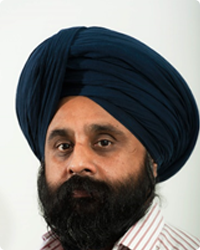 Dr Jagjit Singh Srai is Head of the Centre for International Manufacturing, Institute for Manufacturing, University of Cambridge. His research focuses on the analysis, design and operation of international production, supply and service networks and the disruptive impacts of new technologies, markets and regulations. As Research Director of Project Remedies, a £23m collaborative research programme involving leading Pharmaceutical ﬁrms, applied research explores how new technologies may transform healthcare supply chains. Jag also advises leading multinationals, governments and international institutions including UNCTAD, UNIDO, WEF. Previous roles have been in industry with Unilever working as a Supply Chain Director of a multinational regional business, Technical Director of a national business and other senior management positions. Dr Srai holds a ﬁrst-class honours degree in Chemical Engineering from Aston University, MPhil and PhD degrees in International Supply Networks from Cambridge University, is a Chartered Engineer and a Fellow of the Institute of Chemical Engineers.